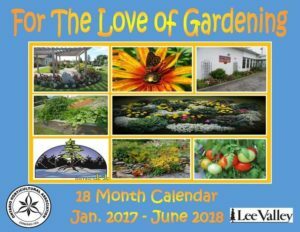 OHA is making this calendar available for purchase for $20. Pictures are from all 19 districts including our district, “District 9.” A perfect gift for the gardener in your life! Contact Debbie Thomas if interested. Did you know Hydrangeas are one of the easiest flowers to dry? Given their size, you need only a few to fill a table arrangement or decorate a wreath. Cut when the blooms are partially dry and slightly papery, in September and October. If cut too soon, the blooms will wilt and not dry; cut too late and they will be brown and less attractive. There are several ways to dry hydrangeas once cut such as: immerse in silica gel, hang upside down, or insert stems in moist floral foam. I find the easiest and most successful method is “water drying.” The blooms desiccate slowly, which helps them keep their shape and colour. While simple air-drying works, too, the end result is more brittle and fragile. After cutting eight to 12 inch (20 to 30cm) stems, strip off all leaves. Place the stems in a few inches (about 8 cm) of water, and set the vase out of direct sun. Leave space around the flower heads for air circulation and to preserve their shape. Then, simply wait for the water in the vase to evaporate. By the time it’s gone, the hydrangeas should be dry. It’s worth trying any type of hydrangea, but I find bigleaf, smooth and panicle ones dry best. Bigleaf hydrangeas dry to muted blue, purple, rose or green, depending on the cultivar; panicle and oakleaf flowers are pink or rose. 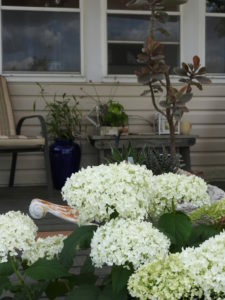 Smooth hydrangeas dry to pale green, ivory or tan. There is always something to discover when it comes to gardening. If you haven’t “discovered” the Dunnville Horticultural Society (DHS), this is YOUR invitation to join us. 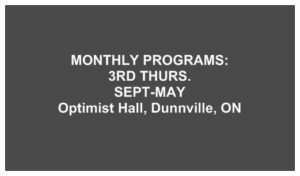 On Sept. 15, we resume our monthly program nights from 7-9pm at the Optimist Hall, 101 Main St. E., corner of Cedar and Main St. Dunnville. Come, bring a friend and hear about “Gardening in Drought Conditions?” by Wendi Prior, Assistant Manager of Terra Nursery, Hamilton. Everyone is welcome, members and non-members alike. Doors open at 6:30pm. Refreshments are served and there is no charge. Founded in 1929, DHS is a welcoming group of people of all ages and gardening stages in life. With a healthy membership of over 260 people, we are a vibrant gathering of men, women, singles, couples, young, middle-aged folks and empty nesters. For more information contact Debbie Thomas, President at (905) 774-3064 or Deb Zynomirski, Vice President at 416-566-9337. Sandi Marr is the Recording Secretary for the DHS and can be reached at sandi.h@sympatico.ca. Sandi welcomes your comments and ideas for future gardening columns. After a summer break from program nights, Debbie Thomas warmly welcomed 78 people, both guests and members. Housekeeping details were highlighted including Emergency exits, Sign-in Sheet, Washrooms, Refreshments, Agenda/Newsletter, and Ways & Means. With sad hearts, we acknowledged the passing of Judy Jeffery on August 14. A celebration of her life was held on August 19 at her home. Judy’s passion was truly gardening. She joyfully served the DHS for many years. At the request of Judy’s family, donations were invited to DHS in her memory. All donations received in conversation with her family will be put towards a future project in her memory. Donations are still being received by Kim Christoff, treasurer. Tax receipts will be issued at the end of the year. Treasurer’s & Secretary’s Report: we are in an excellent financial position. Our minutes and financial reports are emailed and also posted at entrance of our hall on Program nights. Questions may be directed to Kim Christoff, Treasurer or Sandi Marr, Recording Secretary at any time. July 10 Members Self-guided Garden Tours: we were very happy with the self-guided tours of 8 members’ gardens. An average of 34-50 people visited the gardens, with some new memberships sold. Thanks to hosts for generously preparing and opening their beautiful gardens: Deb & Don Zynomirski, Margaret & Mark Bottrell, Marlene & Ron Link, Debbie Thomas & Andy Hyma, Mary Galli, Petra Cruise-Daly, Beth Powell and Ken Sherwood, and Joanne & William Plaenksken. In appreciation, hosts were given a complimentary DHS 2017 membership. The day concluded with a BBQ at the Zynomirski home for Board members and garden hosts. August 13 Summer Horticultural and Winery Bus Tour: we were pleased to report a full coach and a very enjoyable day. Thank you to Deb Zynomirski for organizing this great event and to Don Zynomirski for making the bus ride very entertaining. It was a rich learning experience for all and a fun time to be together with old and new DHS members. Mulch updates: summer weeds thrived under “Muddy” and the two “Welcome to Dunnville” signs. McKays Stump and Tree Removal donated over 9 yards of natural mulch, which was spread at the East and West “Welcome” signs and the rear side of the bed in front of Sweet Retro. Garden Gallery donated 6 yards of black mulch for under “Muddy” and we purchased another 6 yards to complete the job. All 4 beds have been thickly mulched with approximately 5″ mulch. A special thanks to those that came out on several extremely hot, humid days to spread mulch: Kim Christoff, Deb Zynomirski, Marilyn & Alisha Stavinga, Steve Elgersma, Gloria Hunter, and Debbie Thomas. Market Redevelopment: DHS recently gave a donation of $5,001 towards “Market Redevelopment.” Since our mandate (and that of the Farmers Market both fall under OMAFRA), we felt a strong responsibility to support it. Careful planning and fundraising over the past 4 years have lead up to this donation. We have been following the progress of both the Farmers Market and the new Waterfront Park from the very beginning. We are hopeful once the County builds the park, we can offer assistance as well. Great Trike Race, Sept. 9, Haldimand Motors, Cayuga: DHS won $3,350 in prize money (3rd place for float and 4th place in Trike race). Thank you to our brave and great Trike riders, Debbie Thomas and Andy Hyma as well as Rosa Flora for donating Gerbera daisies, Garden Gallery for donating grasses, and Chris Ricker for providing his beautiful Belgian horse team and authentic market wagon for us to decorate. Thank you to Margaret Kamping and her grade 3/4 students at Dunnville Christian School who came out to walk in the parade alongside DHS, and to all our members who came out to show support. We hope to enter again next year. Dunnville Centennial Park/Fountain Rehabilitation: planning continues for this large project. We have secured a partnership grant of $10,367 from Haldimand County to go towards its rehabilitation and also the rehabilitation of the butterfly gardens in front of Muddy. This represents 35% of our projected budget which is $29,620. This is one of our largest scale projects. We are confident we will have funding in place and the work complete for 2017 Canada’s 150th year and Centennial Park’s 50th year anniversary. All winnings from the Great Trike event have been earmarked for this project. Dunnville Christain School is also partnering on this project and are also fundraising. If anyone would like to donate specifically for this project, DHS is a registered charity and will provide tax receipts. We have also applied for funding through Provincial and Federal Canada 150 grant programs, filed in partnership with Haldimand County. If successful, it would form Part 2, enabling new pathways connecting Lions Park to Centennial Park, and making the bridge over Thompson Creek accessible to all. Thank you to Kim Christoff for countless hours of grant application on our behalf. New Business: call for nominations to the Board of Directors for 2017. Nominations are invited until Oct. 20 as per our constitution. We have new positions open on the board due to the passing of Maura Cooper and Judy Jeffery. Resignations have been received from Sue Mazi, Pauline Bradford, and Ian Steel. Appreciation was express to these individuals for their service. Moving forward, we have a strong board but always welcome new directors with fresh ideas and energy. Anyone interested is invited to talk to an Executive member. Members are also welcome to give leadership to specific projects of DHS if there is a project of interest; being a Board member is not required to volunteer with projects. Roll out our updated DHS webste: Sandi Marr & Deb Zynomirski presented an overview of our updated site at: www.dunnvillehortandgardenclub.org. Everyone is encouraged to check it out and watch for regular updates. We are pleased with the new look of our site and believe it will attract younger, new members while providing helpful information to current members. Training will take place Sept. 19 with our designer, Mike VandeBeld so our executive will be able to easily update the site on a regular basis. Joan King, Nelly Englage, Ellen Guenther. Special thanks to Bev McLean for arriving early and organizing our monthly snacks. Please speak to Bev if you are interested in providing refreshments in the future. Everyone’s contribution is greatly appreciated. Refreshments are always a highlight of our program night. Our guest speaker, Wendi Prior, Assistant Manager of Hwy. 20 Terra Nursery, Stoney Creek was announced. Wendi spoke about “Gardening in Drought Conditions” and answered many questions related to gardening. Reminders: DHS Annual Flower & Vegetable Show will be held next month, October 20. Emails will be sent out with categories and details. Copies were also provided at our Sign-in table. Everyone was dismissed and encouraged to return next month to hear returning guest favourite, Jeff Bokma from Vermeers, Welland. Jeff will be speaking on “Houseplants 101” a relevant topic as we head into the fall and winter months and put our outdoor plants to bed. Prize winners were announced for the 10 door prize items generously donated by Terra Nursery, Stoney Creek. Thank you, Wendi on behalf of Terra Nursery. Ways and Means winners were also announceded and many people went home with their arms full of new and recycled garden treasures! Thanks to everyone who attended, first-timers and regular attendees. Also, a big thanks to all those who volunteered to make tonight’s program such a success. Every hand helps! Everyone loves a beautiful floral arrangement. Whether we gather flowers from our gardens or from a store, here are a few tips for “photo-worthy” bouquets. Any space looks more welcoming and cheery with a green, healthy plant or colourful, fragrant floral bouquet. Follow these simple suggestions and you’ll have an award winning floral arrangement every time. Cut blooms in the morning when it is cool. Immediately place them into water. Find a vase that showcases your chosen stems. Experiment with different shapes, sizes and colours. Stick to a palette of similar colours for a cohesive look. Always use odd numbers of blooms for a pleasing and natural look. Asymmetry is key to achieving a “wild, loose-looking” arrangement, if that is your desire. Measure the length of your blooms with the outside of the vase and cut a second time on a 45 degree angle so flowers can easily absorb water. Use a sharp knife for cutting so you don’t damage the stems. Criss-cross cellophane tape over the mouth of your vase to create a supportive framework for stems. You may also wire stems for support or to bend flowers in your arrangement. Mix large, showy blooms with small, delicate flowers. Follage should always be used to soften the arrangement and showcase the flowers. Remove any leaves that are below the waterline as leaves left in water will cause bacteria in the water. Keep follage lower than the flowers so flowers are the focal point. Make sure there is space between the flowers, as well. The space between the flowers is as important as the flowers, themselves. Stand back and look at your arrangement from all angles. Work with it until you get something you like and is pleasing to your eye. Keep in mind where the arrangement will be placed so that it is an appropriate size and height. Change the water every day to preserve freshness. Keep flowers out of direct sunlight for longer lasting blooms. Flowers prefer cooler temperatures to extend their life. Did you know the Dunnville Horticulture Society (DHS) gathers monthly, September – June. Relax for an evening, make some new friends, hear some excellent speakers, socialize and enjoy delicious refreshments. With a healthy 2016 membership of over 260 people, we are a vibrant gathering of men, women, singles, couples, young and middle-aged folks and empty nesters. Join us on Sept. 15, 7-9pm at the Optimist Hall, 101 Main St. E., Dunnville to hear about “Gardening in Drought Conditions” by Wendi Prior, Assistant Manager of Terra Nursery, Hamilton. Everyone is welcome, members and non-members alike. Doors open at 6:30pm. For more information about DHS, call Debbie Thomas, President at (905) 774-3064 or Deb Zynomirski, Vice President at (416) 566-9337.